Originally published by F. A. Battey & Company in 1890, this is a 1983 reprint by Nebraska State Genealogical Society. 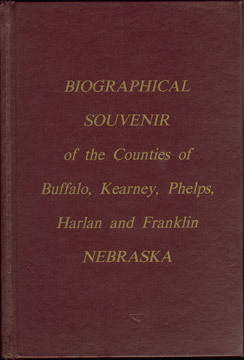 The original edition included biographies of the Presidents and of the Governors of Nebraska which are not included in this edition. Cover and spine show light wear, inside pages are nice and clean, basically as new. This volume is entirely family biographies from the five counties of Buffalo, Kearney, Phelps, Harlan, and Franklin, Nebraska, great for genealogy research.